I am a big coffee fan. In fact I find it almost impossible to complete my cycle to work each morning unless I have topped up my caffeine levels with at least two mugs of the drug. While the coffee tops up my personal energy levels, I need to use some electricity to make the coffee. I decided it might be interesting to use my new energy monitor to measure exactly how much electricity do I consume to keep me fully caffeinated in the mornings. I could use my old fashioned kettle to boil some water and then make instant coffee. This has the advantage of being really easy to prepare. I have a traditional filter coffee maker which makes reasonably pleasant coffee. The preparation takes a little more energy from me, but the taste is better. I recently got a fancy cappuccino making machine. Although there is quite a bit of work involved in using this machine, the result is a lovely tasty cup of coffee and so as a result this is my favoured choice most mornings. The kettle does not consume any energy when plugged in, but not actually boiling water (I didn't expect that it would, but I checked to be sure). When I turned it on it consumed 2795 watts and took about 1.5 minutes to boil a half full kettle of cold water. This means that if I boiled the kettle once per day it would cost me about €3.50 per year in electricity (in reality I boil the kettle much more often than once per day). If I use the filter coffee maker it consumes 928 watts of electricity and takes about 6 minutes to brew a medium sized jug of coffee which fills 3 mugs which is more than enough to kick-start my morning. If I used this device to brew my morning coffee every day for a year the electric bill would be just over 6 euro which is quite reasonable when you consider how much I would have to pay in a coffee shop. 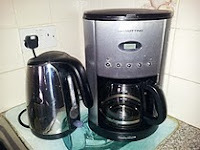 However, I was surprised to see that the filter coffee maker consumed 2.2 watts when plugged in and not in use. I guess this must be because it has a clock built in and it is capable of being set up to automatically brew a jug coffee at a predetermined time so that I could have freshly brewed coffee available as soon as I step out of bed. Although this is a really appealing feature when the salesperson explains it in the shop, the reality is that I never use it, mainly because the mornings when I really need an instant cup of freshly brewed coffee are the mornings after the nights when I am least likely to set up the coffee maker correctly. Simply leaving the coffee maker was costing me about €2.70 per year in electricity - not a fortune, but I thought I might as well save that money so in future I will leave it unplugged when not in use. Next I decided to analyse the electricity usage of the cappuccino maker. This is a more complex device and in fact the reason why I keep the filter coffee maker is because sometimes my personal energy levels are too low to make a cappuccino. My first surprise was to see that the cappuccino maker consumes 1.6 watts when plugged in and not in use. It is hard to understand why this should be the case, unlike the filter coffee maker with its clock function there is no good explanation for why it should consume stand-by power because the cappuccino maker has no LEDs or other indication that it might be consuming electricity when not in use. I resolved that in future I also leave it disconnected from the supply saving me a further €2 per year (every euro counts these days). The milk heater consumes about 466 watts when turned on, but the energy draw is not constant. The heating element turns it self on and off while the milk is being heated (presumably in response to a thermostat). The espresso brewer consumes 828 watts when turned on and it will turn itself off automatically once it senses that the coffee has been brewed (a little green LED comes on to alert me that it has done its work). The whisk is used to give a froth to the heated milk. It is recommended that I only need to use this for 30 seconds and the power consumed varies between 5 and 8 watts depending upon how deeply the whisk is immersed in the jug of milk. Actually I was surprised at how little power this was consuming because it makes such a loud racket that I would never accidentally leave it switched on - but the device consumes about 50% of the same electricity by simply being plugged in. Overall the total power consumption to make a large cappuccino is 0.09 Kilowatt-hours. If I made an average of one cappuccino per day (which I do), the electric bill would be under €5 per year which is quite good value when you consider that there are some coffee shops in Dublin which would charge this for a single mug. However, I was surprised to find that I was spending an extra 50% on power simply by leaving it plugged in while idle. I am very surprised to see your articles here. Quite a lot of them match with my interests and few were literally in mind recently like the one with checking weather forecast accuracy. Although I wanted to do it in more 'manual' way pulling data from accuweather.com. Anyway, will be visiting your blog more often to read some good stuff. Thanks Tomasz for your kind comment. I am glad you find the blog interesting.